Analog video isolation transformers primarily for closed circuit TV (CCTV) applications. The same way as an audio ground loop results in audible hum, a video ground loop will result in video hum bars, annoying horizontal bars of luma (lighter or darker than the image) that usually scrolls up or down in the video image. The purpose of a video isolation transformer is to break up such ground loops, thus eliminating the video hum bars. CCTV isolation transformers are primarily used in large surveillance installations such as airports, malls, train stations, cities etcetera where the different units (camera, switchboard, monitors) are locally powered. 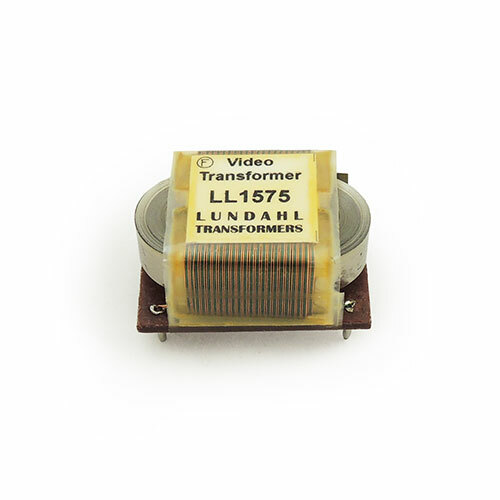 Our LL1575 video isolation transformer is a naked component designed for through hole PCBs. It is primarily designed to be used inside video equipment. LL1575 Video isolation transformer datasheet.